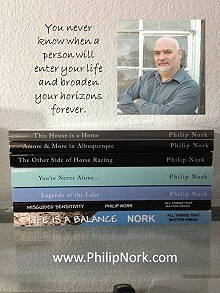 Phil Nork mixes work with his love of writing. In addition to writing, Phil is a baseball card collector, an avid reader, and enjoys listening to the music of his youth, especially Rod Stewart and Air Supply. Of course it has. I work for a major retailer in the U.S. and have to visit 5 different states regularly. Whenever I walk into a location I haven't been to in a while I get the royal treatment from them which means I have to explain why to the customers. I was in a Starbucks in St. George, Utah and the lady in line next to me was holding a copy of my first book. She dropped it as she was paying and when I handed it back to her back cover side up she saw my picture and gasped. I paid for her drink and then proceeded to sit with her and also autographed her book. I actually wrote the outline for my first book after watching the movie Grease in a hotel room in Prescott, Arizona. The movie holds many memories for me and I always catch it when I can. Ellen Degeneres. I think she would keep it fun not to mention I could pitch my books to her. Iced green tea and cashews. To help people realize the theme of all of my books actually happens. That theme is that you never know when a person will enter your life and broaden your horizons forever. That my words have helped my readers open their minds, think about others and have reactions, good or bad, to my words. Misguided Sensitivity awarded the Gold Standard of Literary Excellence by The Princeton Review. Life is a Balance, it isn't only about you awarded the Gold Standard of Literary Excellence by the Princeton Review. Legends of the Lake, #1 Amazon category bestseller. This House is a Home, #1 Amazon category bestseller. The Other Side of Horse Racing, #1 Amazon category bestseller.